I loved this book as much as I loved the first in the series! It focuses on Jack and Dahlia's story rather than Keir and Ava. And it was great to see the world of Nephilim and demon hunters from a different point of view. Jack is such a sweet character, it would be impossible not to like him. And Dahlia has a great combination of light and dark in her personality. She certainly isn't as snarky as Ava, but she is still an incredibly strong character. Through this story you really experience the ups and downs with her, and any behaviour which appeared unreasonable in Soul Ties, is absolutely justified when you know the full story!As always with Lisa's books, the pace is fast, there's plenty of action and just enough unanswered questions to leave you wanting more. Can't wait to read the final book! I loved stepping into Dahlia and Jack's story line. We get a great look at how they fell in love and get to each of them better. Confession... I was not really a fan of Dahlia's character in Soul Ties, but I came to really like her in Torn Souls! I thoroughly enjoyed this book, even more so than the first in the series. I loved the first book and was gripped throughout, but I felt like everything was more intense in this book, and I could understand the relationship between the lead characters Dahlia and Jack far better this time. The pace was a little slower and didn't jump in time quite so much, but mostly I loved how a character I really disliked in book one was really easy to follow, and like in this book. Dahlia was hard going in the first book in this series (Soul Ties) she didn't seem like she had much of a personality, but following her and her story through her eyes and Jacks, I really liked her. You can even see the huge change in her and when it happened. From the Dahlia of before to the Dahlia of after, two totally different people. Jack is totally endearing and I couldn't fault him. It also crossed over partly from book one so you see some of the events from the perspective of Dahlia and Jack this time. This book has answered a lot of questions for me and is paramount to the series. I feel I can read on with the original story with a better understanding now that I have read Dahlia and Jack's story. Which is as equally important as Keir and Ava's.I definitely recommend this story, especially after reading Soul Ties, it answers so many questions and shows us exactly why the characters are the way they are. I was given a copy of this book by the author in exchange for an honest review.Dahlia is a soul-hunter sent to Earth to collect souls and bring them back to their rightful place. Jack is a college student more interested in gaming than attending class. He can’t get Dahlia out of his mind, but she keeps disappearing on him. What happens when Dahlia finally gets the chance to be with Jack long term? Will their love survive the obstacles thrown in their path?When I first was asked to review this book, I was skeptical. I didn’t like Dahlia in Soul Ties. I thought she was too involved in Keir’s life. I was very pleasantly surprised by this book. I loved it from the start. It was great to get the insight as to why Dahlia was the way she was. I loved the love story between Dahlia and Jack. The author did a very good job of getting my emotions involved in this book. I felt the abandonment Jack felt every time Dahlia disappeared. I was very disappointed in Dahlia’s actions toward the end of the book. I really think she needed to worry about herself and her own relationship not Keir’s. I was very happy when she seemed to finally wake up and start worrying about herself. I was also loved all the growth that Jack accomplished in his life. Overall, this was a very well written, easy to read book. I can’t wait to read more by this author. This book follows the story of how Jack and Dahlia met and is narrated by both characters. I wanted to know more about their story when I was reading Soul Ties and this romance between the gamer and the soul-hunter was funny, awkward and heartbreaking, in a very relatable way. It took me back to when I was that age, and I remembered all those angst-y feelings, which was really sweet. Jack is definitely not a typical romance hero but you can’t help fall in love with him. He’s equal parts adorable and hot, in that completely understated way that some guys are at that age. Even though I knew the fate of the pair from reading Soul Ties, it was interesting to read those events from their point of view. I especially wanted to know what the relationship between Dahlia and Keir was really about and how she feels about him. I saw a different side to her character than in Soul Ties and feel a bit more sympathetic to her after reading this. Now I know more about the four main characters in the Soul Ties series I can’t wait to see where the story leads them all in book 3. Again, I loved the quality of the writing and the pace. I love that this is Jack and Dahlia's story. i still don't like the bitter person she is now but this book explains it all. I feel for them! good book. cant wait for the third book! Interesting Sequel, Although This Book Sets the Stage for the Neverending SeriesI originally purchased book 1 in the series "Soul Ties" as part of the "Name Your Demon" set, and I enjoyed the first book enough to purchase the sequel separately. 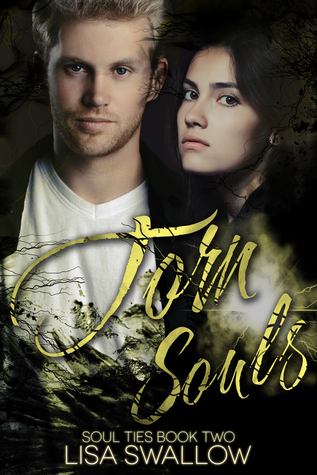 Torn Souls though is a bit misleading since the first half of the book is a prequel showing two side characters, Jack and Dhalia's story of how they met and fell in love. Their relationship though is just awkward and I found that the explanation that they were soul mates that couldn't explain their attraction to one another a bit insufficient. The first part of the book does turn out to be interesting and although you know what will happen to them in Soul Ties, it gives the chance to connect with these characters on a deeper level. It will help you understand their characters more as the series goes on. One aspect I like about Swallow's writing style is that each new chapter is from a different character's point of view which makes the book more interesting. You don't know who you will hear from next. I do not think the series would be as successful if it was written from a single character's point of view. Torn Souls elaborates more on the "Divergence" feel to it with slightly more information on the Caelestia government calling the shots with questionable intentions, although I still feel like by book 2, we should have a better understanding of the theorized "corrupt" government by now. Unfortunately, the book feels choppy and rushed to get to the important information or exciting action scenes.The second half of Torn Souls is a review of book 1 (Soul Ties) also from Jack and Dhalia's perspective. Although it gives some insight into their emotions and observations that you lack from book 1; the book again feels rushed and I honestly do not think that it gives a sufficient amount of new information to warrant a review of the exact story I just finished reading. When I get into a series, I look forward to a continuation of the story; not take 10 steps back and re-read it all over again. By then, the excitement is gone. You know how it ends and sadly makes you want to skip the second part of the book to hopefully catch up to book 3. Yet you keep reading because there just MIGHT be a few morsels of new information you glean from sticking it through. Unfortunately though, book 3 will end up being another stalling point since it is a prequel to book 1 and a prequel to the prequel from the first part of book 2. I honestly think when writing a series, the author should establish the series first before backtracking through prequels and re-writes. Otherwise you end up reading a dead-end series that goes in circles and loses readers along the way. I really wish I could give this series better reviews, but the way the series has been set up from the beginning, I just have a hard time sticking through it even though the plot, romance, excitement of new "species" I haven't read much about, intrigue from alternate versions of supernaturals you find in other paranormal stories, etc. is all there to give it potential to be a unique new series.